I like to have a hard copy disc in hand for all my software purchases. Where can I obtain a CD for Studio One 3? How can I get a PDF copy of STudio One owners manual to read on my android tablet? I want to get a printed copy of the manual for Studio One Artist. 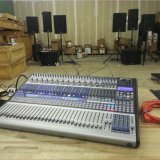 Can I buy one from Presonus?